We Wish You A Merry Christmas will have you swinging out the door for your holiday season. This arrangement features the basic theme followed by a rumba section and then a swing section. The piece ends with its initial introduction. 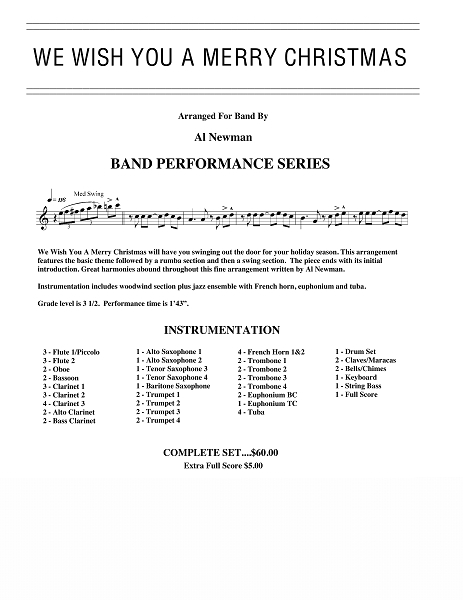 Great harmonies abound throughout this fine arrangement written by Al Newman. This arrangements has an enbedded jazz ensemble with woodwind section, plus French horn, euphonium and tuba. This recording was done by The Butler University Wind Ensemble, Dr. Robert Grechesky, Director. The band performs the finest in wind music from the Renaissance to the present in a concert series presented in magnificent Clowes Memorial Hall on the Butler Campus, as well as other venues throughout Indianapolis and central Indiana. The Symphonic Band & Wind Ensemble is open by audition to any student enrolled at Butler University and provides the campus and Indianapolis community with a rich, cultural and artistic resource.